Campbell Scientific’s Jaume Pallarès Bassets (Director, Campbell Scientific Spain S.L.) 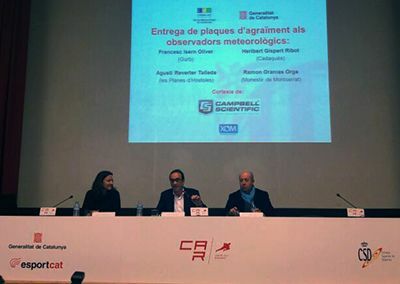 recently attended the “VIII Trobada dels Observadors Meteorològics de la XOM” (VIII Meeting of XOM network’s Meteorological Observers), organised by the Catalan Met Office. Campbell Scientific had sponsored the event awards which were presented to long time weather observers for their contributions to the observation network over the years. The awards were presented by Catalan Environment Minister, Sr. Josep Rull and Director of the Catalan Met Office, Sr. Oriol Puig. 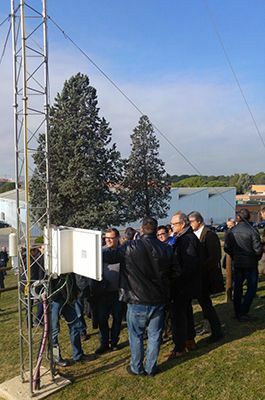 The event was held at the Car Sant Cugat, where the Catalan Met Office has one of the 185 Campbell Scientific CR1000 based weather stations it operates in its observation network. Attendees had an opportunity to view the weather station.